Enter the World of Relaxation & Luxury Set in the Lush Rainforest! Widely regarded as one of the most luxurious eco-spas in the world, Tabacón Hot Springs opens its doors to tourists on day passes. Enter a world of relaxation and luxury in this one-of-a-kind resort that features countless hot spring pools with different temperatures, a healthy snack bar and restaurant, and a world-class spa where you can indulge yourself in beauty treatments and massages. The Arenal rainforest hanging bridges are located in a 250-hectare reserve of primary forest! This is a great relaxation tour for anyone who wishes to get up close and personal with the native flora and fauna of the rainforest followed by a soak in the thermal hot springs. Your fun begins when you are picked up from your hotel and driven 30 minutes to the entrance of the hanging bridges. The three-kilometer trail loops you through the mountainous area and into the rainforest. The forest is home to many animals and birds like howler monkeys, poison dart frogs, red frogs, snakes, toucans, and parrots. All in all, a fun and informative 2.5 hour walk! There are 16 state-of-the-art hanging bridges introduce you to the forest’s rich biodiversity. Ten of the bridges are static bridges between 8-22 meters long, while the other six are hanging bridges between 48-98 meters long. Head to the luxury Tabacón thermal hot springs. Famous for their therapeutic benefits since ancient times, the thermal hot springs are well known for helping to relieve stress and tension in both the body and mind while detoxing the skin. 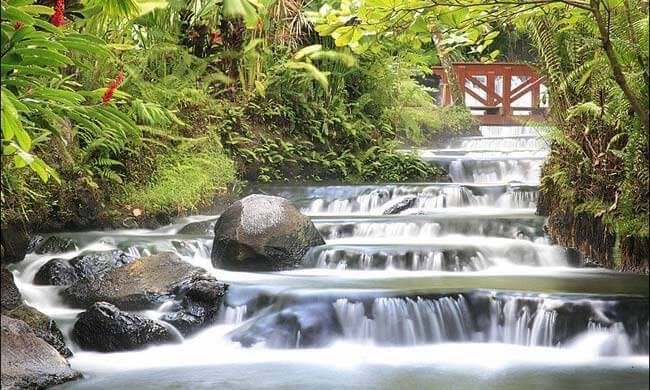 The Tabacon hot springs are the most luxurious in the area and are found dotted all over the property’s rainforest gardens. The 25 pools vary in temperature between 77º F and122º F. The hot springs at Tabacon are naturally heated by the magma found in the earth’s core. Spend two hours bathing in the mineral-enriched hot springs before enjoying an delicious meal at the Tabacon restaurant and then heading back to your hotel feeling refreshed and relaxed. Your tour includes: Transportation, entrance to the hanging bridges and hot springs, guide, dinner. What to bring: Swimsuit, towel, change of clothes, extra cash for additional drinks, camera. Features: Tabacon Spa is known for its trademark beauty treatments like facial cleansing, deep tissue massage, lymphatic drainage, and manicures. Make sure to schedule your treatments in advance.